We are very pleased to welcome back the Explosive Live Orchestra to Weston once again, after an amazing gig in November 2018. They will be returning to Weston's perfect venue, The Winter Gardens on Weston's seafront for the third time on Saturday 28th September 2019. You'll enjoy an epic night of rock classics and melodic symphonic rock by the most sought after ELO tribute band currently touring the UK & Europe, showcasing the songwriting and genius of Jeff Lynne and the Electric Light Orchestra. A full 8-piece outfit, including the famous string section, gives fresh life to ELO classics. A night not to be missed! We are very pleased to announce that we will be offering both seated and standing tickets for those that would like to choose. 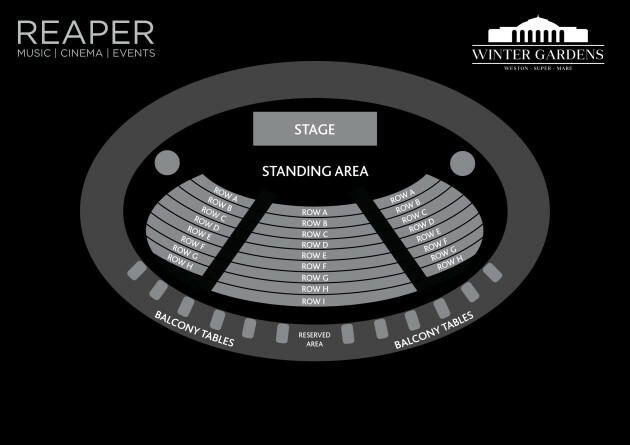 The seated tickets will be valid within a row of seats that will be clearly marked. Row A will be the front row and will continue backwards to the back of the room so you will be able to choose a row but not an individual seat. We hope that makes sense but each row will only have the correct amount of seats sold for each row. You will be able to return to this row all evening as these chairs are reserved for you and your party. If you are registered disabled, and require additional space, please inform us prior to the event and we will ensure we allocate an area for you to sit in. If you arrive at the event without informing us, we will do our best to allocate you, but in all cases we would request that you bring proof of disability in the form of either your DLA entitlement, PIP's, Blue Badge or Access Card. Please contact us prior to any of our events if you have a Personal Assistant so that we can issue you with a free ticket for them.